“The ITM was groundbreaking, but POPi/o takes the future of video banking to the next level,” said Greater Nevada Credit Union Vice President of Consumer Lending Marcus Wertz. 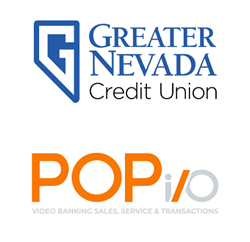 POPio Mobile Video Cloud (POPi/o), the industry’s first interactive mobile video banking solution, today announced its selection by Greater Nevada Credit Union (GNCU), northern Nevada’s largest locally-owned financial institution, to extend and enhance branch services through face-to-face virtual assistance for its membership of more than 65,000 consumers and small businesses. Ushering in a new era of self-service, POPi/o’s patented platform merges video chat with real-time digital collaboration between customers and financial institutions. GNCU will first introduce POPi/o to its members though branch-based video technology capable of facilitating simultaneous collaboration on complex banking tasks including document approvals and applications, ID verifications, consultations and more. To help financial institutions best serve customers and improve internal performance, POPi/o’s Executive Dashboard and Support Center provide detailed call histories, analytics and advanced management functions, including an industry-first application for emotive recognition. POPi/o is also easily deployed within existing systems and allows financial institutions to smoothly present LOS (loan origination system) documents and incorporate other current customer service applications. POPi/o to improve financial services, visit https://www.popio.com/. Greater Nevada Credit Union (GNCU) is headquartered in Carson City and has been helping Nevadans with their financial needs since 1949. The credit union serves more than 68,000 consumers and small businesses and has more than $965 million in assets. Greater Nevada is the title sponsor of Greater Nevada Field and has been consistently recognized as both Best Financial Institution in many of its service areas and as a top employer by the Reno/Tahoe Best Places to Work Awards. GNCU’s subsidiaries include Greater Nevada Mortgage, Greater Commercial Lending, and Greater Nevada Insurance. GNCU is open to everyone living or working in Nevada. For more information, visit gncu.org. POPio Mobile Video Cloud (POPi/o) is a web and mobile video software solution bridging the gap between businesses and their customers. Through increased connectivity, this comprehensive and interactive solution enhances customer communication and action to empower sales and give companies the tools they need to exceed customer expectations. For more information regarding POPi/o, visit https://www.popio.com/ or call 801-417-9000.